John AxelrodGraduado student at Harvard and Leonard Bernstein, this settled and is in love with Sevilla Texas, since 2014, Musical and Artistic Director of the Royal Seville Symphony Orchestra (ROSS). 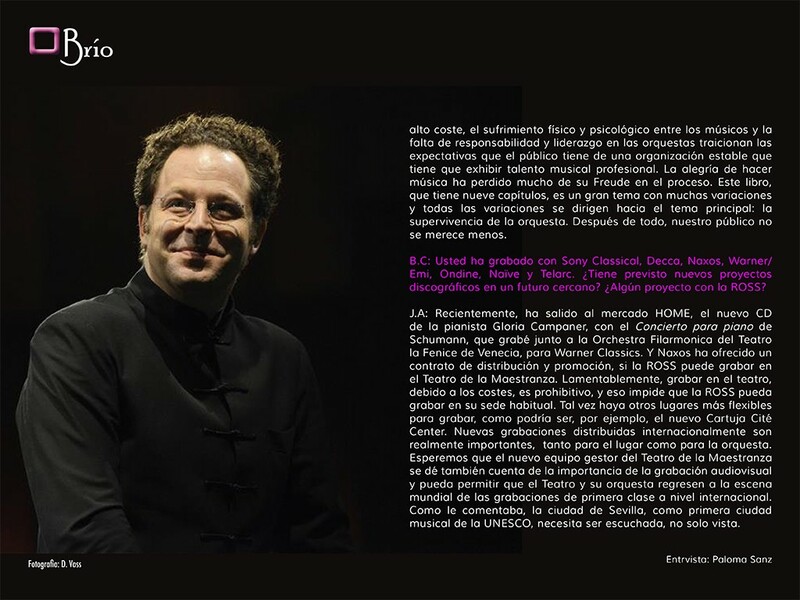 Combines his orchestral work to support young musicians through the activities of its founding CultureAll, with which he is carrying out an important work of musical outreach, among other cities, In sevilla. Passionate and sensitive for everything he does, John Axelrod, talks about his incessant artistic activity. Brío Clásica: The following days 4 Y 5 from January, will lead the "New Year's Concert" with the Royal Seville Symphony Orchestra (ROSS) at the Teatro de la Maestranza with soprano Teodora Gheorghiu. What will perform opera arias? 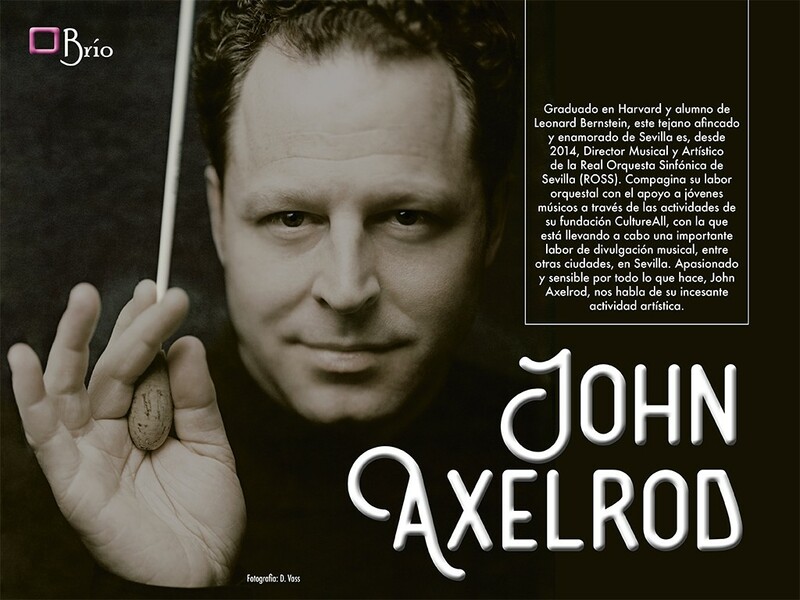 John Axelrod: Be well known arias of bel canto soprano, chosen by Teodora Gheorghiu own, will be the guest soloist of the concert and made its debut in Sevilla. Teodora I discovered when I was Music Director in Lucerne, before becoming a leading soprano of the Vienna State Opera. We managed to bring superb singers for our New Year's concerts, so I am very excited to welcome in Seville Teodora. Besides known Aryan of operas Lastraniera, Lucrezia Borgia and The Pirate, the orchestra will also play the Sinfonia of Il Pirata, Bellini, Overture Donizetti's La Favorite, and the overture to Rossini's La Cenerentola. B.C: In the second part of the concert, also perform works by Johann Strauss II, with which wishes to pay tribute to women. J.A: Yes, so is. Why a tribute to women? Plain and simple, because the 2018 It has been a significant year for the voice of women, without which we would not exist. I have been a father again, so it is also a tribute to my wife, while GSN and we show our respect and honor all women in the world. Actually, the concert is a celebration of women, from the warrior goddess, heroin, the femme fatale, the madonna ... Strauss Jr. also paid tribute to the remarkable women of the Austro-Hungarian Empire. They inspired the art of Kokoschka, Klimt and Mucha ... the music of Mahler and became muses of many other men who found their inspiration in the beauty and truth of the eternal feminine. Strauss gives us good examples of this and we are happy to share these musical bonbons with our loyal audience. B.C: This concert outside fertilizer has the support of CultureALL. What is the purpose of this association? How CultureALL supports the ROSS? J.A: The aim of the Association CultureALL, of which I am President, It is playing at historic sites, working with great composers of today, and contribute to the development of great musicians of tomorrow, promoting access of marginalized communities to cultural heritage. Sevilla, first City of Music UNESCO has benefited from our donations, and UNESCO have been other cities such as Venice and Krakow. I am proud to offer this financial support to many projects ROSS since I became its artistic director and Musical, open rehearsals disadvantaged Seville. It is unusual for the Artistic and Music Director of an orchestra contributes to the welfare of the orchestra, but in my case the ROSS is the lucky beneficiary of the generosity of my association. Teodora Gheorghiu is a young soprano who deserves recognition, GSN and deserves increase their profile. If I can contribute, through CultureALL, these interesting projects, the benefit is mutual. B.C: In February, will direct "Amadeus" with ROSS, his version of the famous play by Peter Schaffer What is this project? J.A: Everyone knows and loves Mozart. And most people know the award-winning film Amadeus, directed by Milos Forman and inspired by the work of Peter Schaffer. The play and the film humanizes Mozart. And envy and conspiracy Salieri to Mozart reveals purely human emotions. Who has not envied the talent of others? But what makes it so real are not the characterizations of these historical figures or the sublime music of Mozart heard during the film, but the fact that music is more important than ourselves, a genius can create what only a genius can do: The voice of God. This is how Salieri describes the music of Mozart. What if, according to the Bible, we were created in the image and likeness of God, We can see ourselves reflected in the musical voice of Mozart. This work, I've adapted to be performed live, with orchestra, choir, actors and soloists, It offers several new features since its premiere 1998 They make us reconsider Directory Submission. Of course, It's great to play the music of Mozart concert, but this total drama, It is a Gesamtkunstwerk theater and music, which challenges the idea of ​​what we mean by traditional concert, and it offers a new model: a hybrid, that is to say, an interactive experience that is concrete and abstract at the same time; The story follows the music, in the same way that music follows the text. The costume is real. The film comes alive. "Amadeus in Concert" has been presented in several countries with great success. Renowned actor Roberto Quintana will interpret Salieri in Sevilla, in the Spanish debut of the work. B.C: In March, will begin a tour of Germany with ROSS guitarist Pepe Romero and. What concert halls will perform and interpret what program? 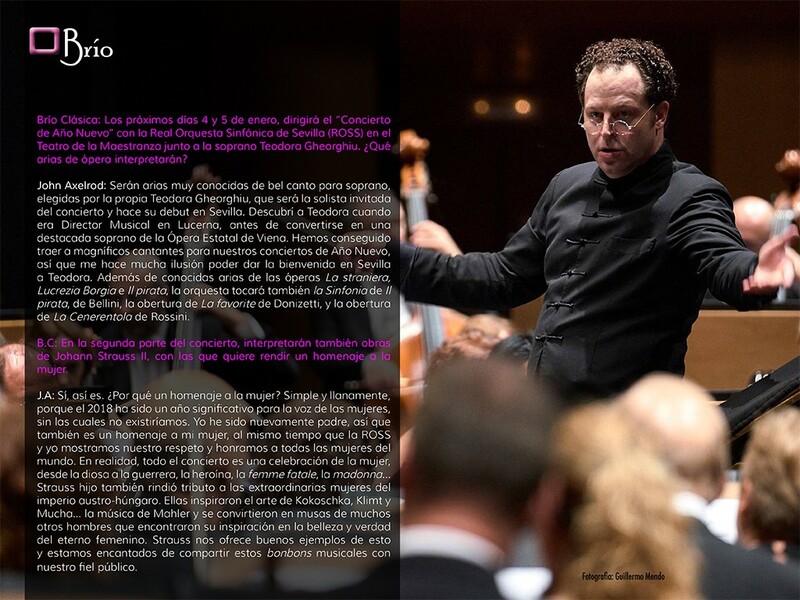 Do you think it will reinforce the international projection of the Seville orchestra as an ambassador for the Andalusian Spain and in the world? J.A: The legendary Pepe Romero meets 75 ROSS years and celebrating his birthday with the immortal Concierto de Aranjuez and L'Arlesienne Bizet. We will do this program in what will be the return of the international circuit ROSS after ten years. Act at the Tonhalle in Düsseldorf, The bell en de Bremen, in the new Elbphilharmonie Hamburg (with "sold out"), Cologne Philharmonie, the University of Regensburg and the Alte Oper Frankfurt.Uno of my goals since I became Artistic Director and Musical has been to increase not only the quality but also ROSS its international profile. Having directed more than 165 orchestras worldwide, I can say without hesitation, ROSS that is the best orchestras in the world and deserves to be recognized as such. Fortunately, We've had a lot of criticism, both local and national, to confirm this. So, I think dramatic, that financial circumstances and political immobility have prevented the ROSS convey his musical message in the world, both live disk. When I went for the first time the orchestra almost eight years ago, like many other colleagues, I was pleasantly surprised by the quality of world-class orchestra. Sevilla is, definitely, one of the most beautiful cities in the world and the scene of more operas than any other place on the planet. How is it then possible that the orchestra of this city is not recognized internationally? Why not convert an instrument orchestra as an ambassador for his city, autonomous region and country? Según Lonely Planet, Sevilla is now the first tourist destination in the world 2019. With this tour with "sold out", Sevilla take the world, in the same way as we do when we embrace the International Classical Music Awards (ICMA) in April 2020, noting that the Royal Symphony Orchestra of Seville and its city are more than a musical note in history, and they are writing their own chapter in the future of the European orchestral performance. B.C: Another great bet has been attracting a new audience through ROSSTV / ROSSCLUB program. What is this program? 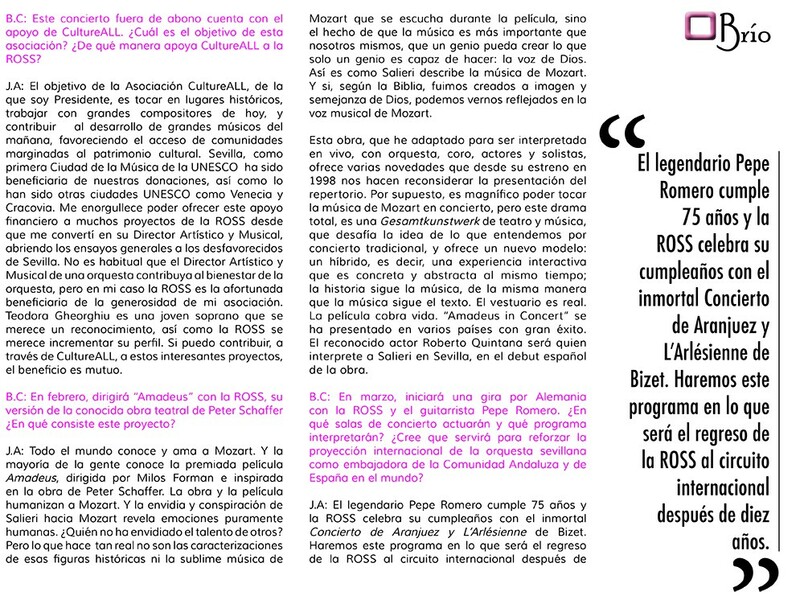 J.A: It is a unique initiative that no other orchestra in Spain has made; ROSSTV and ROSSCLUB have the potential to revolutionize the development of public for ROSS. Www.rosstv.es website is a portal that synchronizes our identity online, and promotes social activities that bring ROSS people it serves: your audience. Our ROSSTV is a new school, fully open, without Borders. It is multilingual. It is local, regional, National and international. ROSSTV educates, reports, He is doing interviews and inspires. ROSSCLUB is our social community, online and offline. Its members can access the entire contents of ROSSTV, attend ROSSCLUB activities and enjoy the many benefits and discounts offered. And the best of all: It's free. B.C: What are your future plans with ROSS? J.A: For this season, with the theme "The music and the written word", is being a success. The idea of ​​combining literary sources as inspiration for composers can offer different options to the standard repertoire. We have focused, for example, in Lorca, Cervantes, Pushkin and even the Bible. And soon we will have a program with Schiller and Strauss Eine Alpensinfonie, a concert that also marks the debut of the famous violinist Sevilla Patricia Kopatchinskaja; We continue with the symphonic poem Tod und Verklärung Strauss, y de Transfigured Night Schoenberg. We will have other programs that revolve around Fausto, a formidable issue that is present in the eponymous overture to Wagner, y Shakespeare, the eternal poet, will complete the season with A Midsummer Night's Dream, with the fantastic chorus of Teatro de la Maestranza, directed by Inigo Sampil. It makes me especially excited Schumann symphonic cycle and complete Rachmaninov piano concertos, I feel very close to my heart. During the Seville Fair, the annual event in sporting Seville, every year I really enjoy dancing and singing in the stands. And I have a special interest in the return of the famous singer Wallis Giunta, to show his extraordinary charisma in a program with Spanish and Latin American songs. On the other hand, We are already looking to the season 2019/2020. There is a symphony I've been wanting to do for a while, Symphony No. 8 Mahler, ROSS play the first. The next season, Besides, We offer the possibility to continue to hold the 500 First Anniversary World Tour Magallanes and Elcano. Fortunately, all our seasons have been very successful, especially this season, but the next has the potential to be unique and special for many reasons, not only in terms of repertoire. You could even make history. B. C: You've had special prominence during the centenary celebrations of Leonard Bernstein, whose repertoire has played both GSN and other international orchestras. Plus, Lenny has written and Me: On Conducting Bernstein’s Symphonies, published in Naxos. What he most admired Lenny? 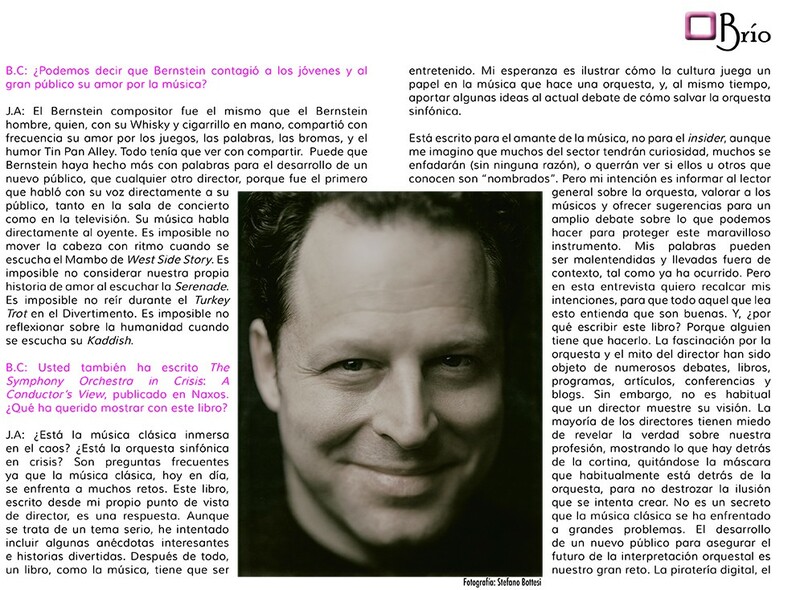 J.A: As a student of Lenny, and as Artistic and Musical Director of the Royal Orchestra of Seville, I programmed Bernstein's music for the anniversary of 2018 than any other Spanish orchestra, Spanish Sevilla making the epicenter of the centenary celebrations of Bernstein. I met him in Houston during the premiere of his final opera A Quiet Place. After a favorable introduction, let me play the piano, and then he offered me to study with him. It was not just a director, It was pure musical talent, a word that encompasses much more than simply direct, and to define much better than any other category. When we work together, I remember taking a score of his library, the analyzed, played passages and shared stories about her. It was a much better education than any conservatory. After a month, He told my parents that I was not only a pianist but a director. When they asked why, answered: "Because I really like people". And he was right; Directors have to have people skills because we play with people playing instruments. J.A: Often, I imagine how he would have reacted if he had said: “Maestro, within 25 years I will be directing his Candide at the Théâtre du Châtelet in Paris and at La Scala in Milan ". Probably, I would have smiled and offered with my health Scotch Whiskey, saying "Did you see?, he was right". Since then, I have directed all orchestral works composed by Bernstein. But not only is the music of Bernstein, but of all music I learned from Bernstein and has had a great influence on my musical mind. Of all the composers, I would say that Mahler was the most inspiring and enriching; but nevertheless, I dare say that his own Symphony No. 3 “Kaddish”, It has been the most important. To be considered an "Bernstein", It is a great compliment. We can not forget that it was the cycle of Mahler Bernstein himself who now lends credibility to the term "Mahlerian". This interplay recently shown with ROSS, with a program entitled "Two titans; Bernstein Bernstein Mahler ", interpreting Symphony 1 "Titan", Mahler, and Symphony No. 1 “Jeremiah” de Bernstein. B.C: Why did you decide to write a new book on Bernstein? J.A: Despite the hundreds of books on Bernstein, according to his family, He never had published a book about running your music. So he was directed to Lenny what inspired me to write a book about running your music: Lenny & Me. What I interpret from the perspective of director is always having to Lenny, director / composer, in mind. B.C: Can we say that Bernstein infected youth and the general public his love for music? J.A: The composer Bernstein was the same as Bernstein man, who, with his whiskey and cigarette in hand, frequently he shared his love for games, words, the jokes, and humor Tin Pan Alley. Everything had to do with sharing. Bernstein may have done more with words to develop a new audience, than any other director, because it was the first to speak with his voice directly to your audience, both in the concert hall and on television. His music speaks directly to the listener. It is impossible not to move my head rhythmically when the Mambo from West Side Story listening. It is impossible not to consider our own love story when listening to Serenade. It is impossible not to laugh during the Turkey Trot in the Divertimento. It is impossible not to reflect on humanity when he hears his Kaddish. B.C: You've also written The Symphony Orchestra in Crisis: A Conductor’s View, published in Naxos. What you wanted to show with this book? J.A: Is classical music immersed in chaos? Is the symphony orchestra in crisis? They are frequently asked questions as classical music, nowadays, It faces many challenges. This book, written from my own point of view director, It is a response. Although it is a serious issue, I have tried to include some interesting anecdotes and funny stories. After all, a book, like the music, It has to be entertaining. My hope is to illustrate how culture plays a role in the music that makes an orchestra, Y, at the same time, contribute some ideas to the ongoing debate of how to save the symphony orchestra. It is written for the music lover, not for the insider, although I imagine many will be curious industry, many will be angry (with no reason), or want to see if they or others they know are "appointed". But my intention is to inform the general reader about the orchestra, evaluate the musicians and offer suggestions for a broad discussion on what we can do to protect this wonderful instrument. My words can be misunderstood and taken out of context, as it has already occurred. But in this interview I want to emphasize my intentions, so that anyone who reads this understands that are good. Y, Why write this book? Because someone has to do it. Fascination with the orchestra director and myth have been the subject of numerous debates, books, programs, articles, conferences and blogs. But nevertheless, it is unusual for a director shows his vision. Most directors are afraid to reveal the truth about our profession, showing what's behind the curtain, taking off his mask is usually behind the orchestra, not to destroy the illusion that tries to create. It is no secret that classical music has faced big problems. 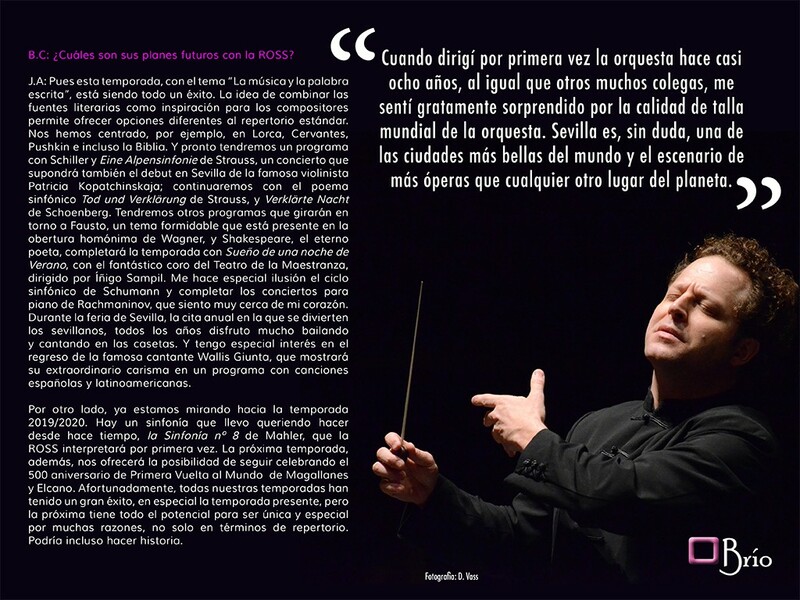 The development of a new public to ensure the future of orchestral performance is our great challenge. Digital piracy, the high cost, the physical and psychological suffering among musicians and lack of responsibility and leadership in orchestras betray the expectations that the public has a professional stable organization must exhibit musical talent. The joy of making music has lost much of its Freude in the process. This book, which it has nine chapters, It is a big issue with many variations and all variations are directed towards the main theme: the survival of the orchestra. After all, our public deserves no less. B.C: You've recorded with Sony Classical, Decca, Naxos, Warner/Emi, Ondine, Naïve y Telarc. Are you planning new recording projects in the near future? Any project with ROSS? J.A: Recently, He has come on the market HOME, the new CD by the pianist Gloria Campaner, the Schumann Piano Concerto, I recorded with Orchestra Filarmonica del Teatro la Fenice in Venice, para Warner Classics. 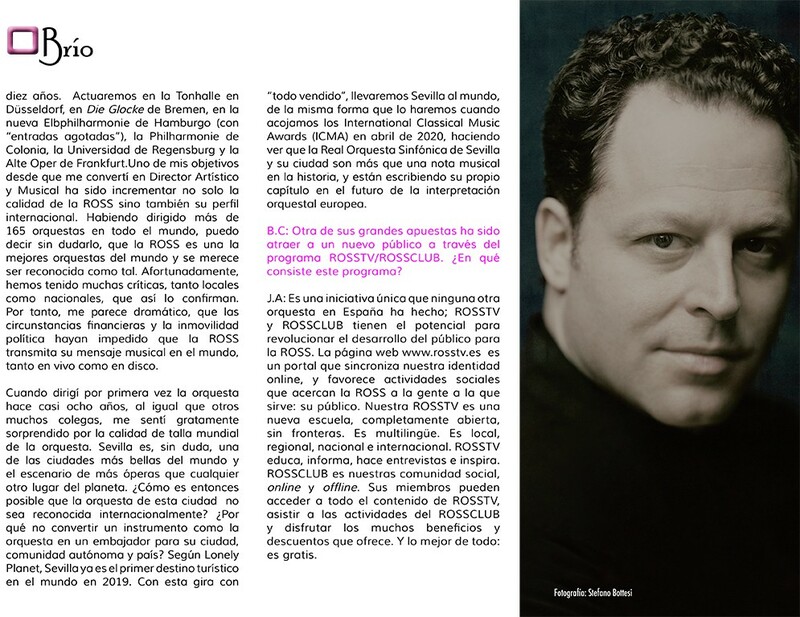 And Naxos has offered a distribution and promotion, if the ROSS can record at the Teatro de la Maestranza. Regrettably, recording in the theater, due to costs, It is prohibitive, and that prevents the ROSS can record in its usual venue. Perhaps there are other places to record more flexible, as might be, for example, the new Cartuja Cité Center. New recordings are distributed internationally really important, for both the place and for the orchestra. Hopefully the new manager of the Teatro de la Maestranza team also realize the importance of audiovisual recording and to allow the theater and his band return to the world stage of recordings first class internationally. 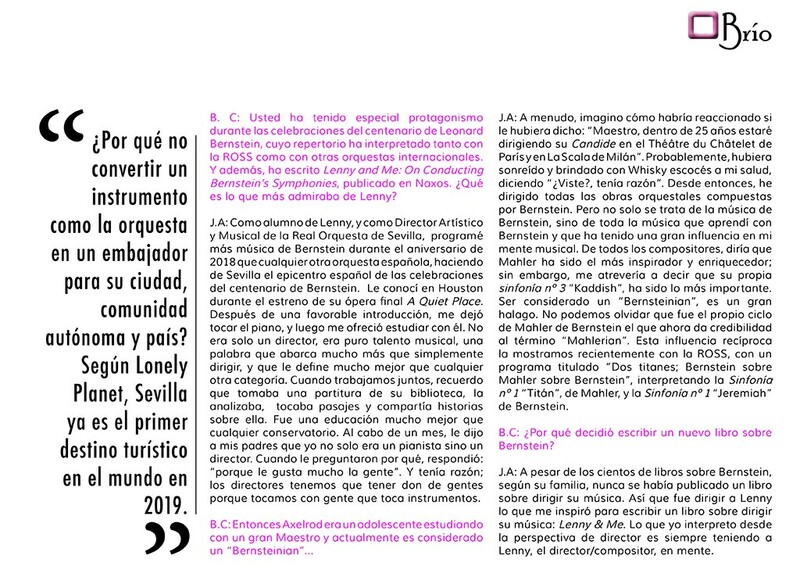 As I commented, Seville, first musical city of UNESCO, You need to be heard, not only view.